Spicy Vegetarian Chili! | Delicious! Delicious! Rain pours down in thick sheets over the expanse of the set now covered in blue tarp. Straggling crew members scramble to get the last pieces of equipment under cover. Caryn jumps, knocking an empty can to the floor with a loud clang. Caryn chases the can over to the couch where Mr. R. sits like a sopping wet puppy with a towel draped over his shoulders. They think they’re going to resume shooting today? Ha! Caryn tosses the can in the trash. She stirs a spoon through a simmering pot of spicy chili. The multi-colored beans seem to be the only color in the trailer turned monochromatic from the pelting rain. This is ready. It’ll warm you up. They should send us home. Caryn prepares a bowl of chili, complete with a dollop of sour cream and snipped fresh chives. Mr. R. wraps his hands around the warm bowl. POUNDING THUNDER shakes the trailer. Caryn backs against the wall. Mr. R. seems undisturbed, concentrating on the hot chili. She quickly regains composure and collects the other cans from the counter. Mr. R. takes a break from his lunch to look out the window. The storm is just getting started. He looks over to his chef who is trying to remain cheerful amidst the gloom of the afternoon. Caryn, you should take the limo back to your room. She looks up from her work. That’s very kind, but I’m okay. He holds her gaze, not accepting her answer. Leave it! Just go. There’s no reason for both of us to be miserable here. She pauses to examine her unfinished work. Slowly, she collects her things and heads to the door. Call me if you need anything? He nods and returns to his chili. Caryn slips out, leaving her boss to brood alone in the mess she left behind. The chipotle peppers lend so much of their flavor to this quick chili, you’ll think it simmered all day long. 1. Heat oil in large, heavy dutch oven over medium-high heat. Add onions and green pepper and saute until transulent and tender. 2. Add garlic and saute for one minute. Add cumin, oregano and chipotle peppers and saute 1-2 minutes, stirring constantly. 3. Add beans, tomatoes, paste and water. Bring to boil. Reduce heat and simmer 30-45 minutes, or until thickened. This looks absolutely mouthwatering. Thanks for the recipe and the story. I love reading this! My stomach has hit the mid-afternoon gumblings, and this post didn’t help! How lovely and comforting that bowl looks, add some cornbread and I’m in heaven. Great new recipe! I’m hoping those peppers will help spice up my new crush at a party I’m heading to this weekend – woo! Maybe he’ll think I’m hot stuff too;) We’ll see! Hellooo to Mr. R holding Caryn’s gaze…! I love chili, and this one sounds great. The more beans the better as far as I’m concerned. Sounds so easy too! It is excruciating to wait between your entries! What will happen? What will you make next? Will Lauren slip on her stilettos and land in the mud? Will Mr. R dump Miss A. and sweep his chef to his next premiere? Oh…. the anticipation! All, I’m glad the recipe sounds interesting. I was so happy with the results from so little effort. Those chipotles pack a punch! Hi Caryn…ooooh, I love chipotles in my chili, as well. Of course, it also looks fantastic, as usual! As my meat-eating boyfriend and my vegetarian-self said when we saw that picture: Mmmm! We shall be making that soon I believe. Thanks Nordljus and Who Wants Seconds! Gemma, the chipotles add enough heart to satisfy us meat-eaters too. Let me know if you make it! Caryn, I’m going to make this for dinner tomorrow night. My only problem is that I can’t find any chipotle peppers. Well, maybe this is more my husband’s problem, as I am a spice wuss and am frightened by the word “spicy” in any recipe. This looks too delicious to pass up, though, and I’m going to also make cornbread in a cast iron skillet I bought based on your 5/28 recommendation. Can you give me an idea about what to substitute for the peppers? I have chili powder or red pepper flakes or I could get chiles or jalapeno peppers. Anything that I could use that could be adjusted to our very different tastes would be good. Sorry this is so long. You are so wise in the ways of food, and I would love any help that you could give, though! Laura, you can always substitute 2-3 TB. of chili powder, but it may not be as smoky as the chipotles make it. The chiptoles that I used were canned in adobo sauce. They are usually with the “ethnic” foods in the grocery store…with the other Mexican items. If you can find them, but don’t want it too spicy, you can always add the adobo sauce and leave out the chipotles. 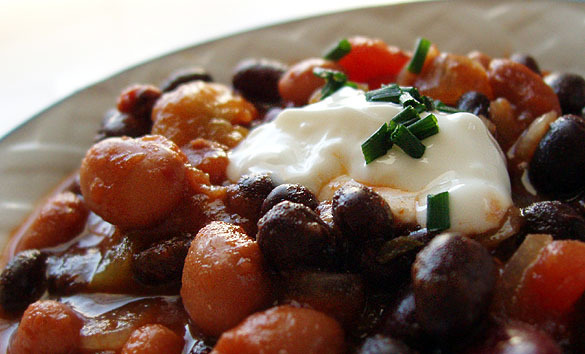 As with any chili, you can garnish with sour cream, cheddar cheese, or onions if you want. I hope you like it! And let me know how that cornbread turns out. Yum! variation of this chili? Clever girl.